Several large lead-glass basins of this type have survived, probably because of their gentle use in the bedroom rather than on the dining table. It is likely that the large helmet-shaped jugs made by George Ravenscroft (1632-1681) were intended to complement these basins. A small number of Ravenscroft's products have been positively identified by the presence of the raven's-head seal, as seen on the base of this bowl. 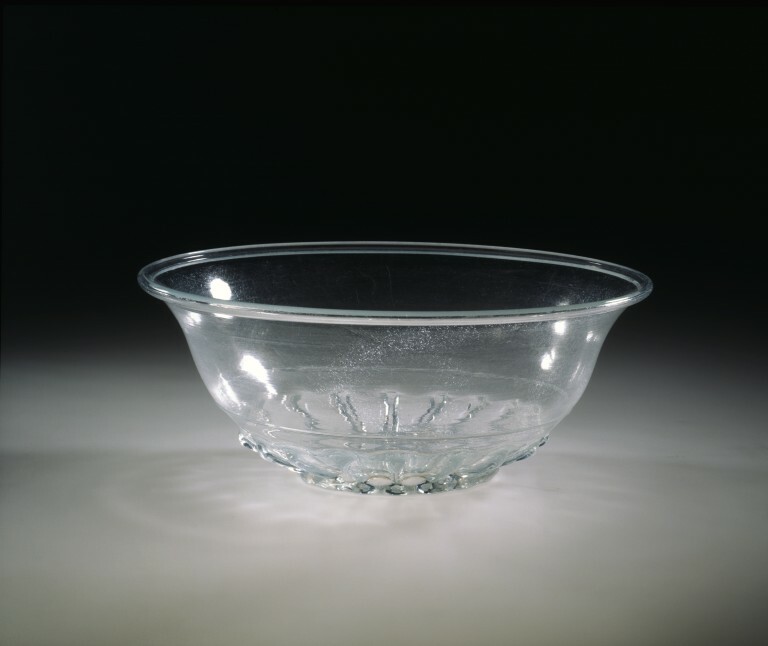 Although this was used in 1676-1677 to guarantee that these pieces were made from an improved glass formula and would not become 'crizzled' (marred by a fine network of tiny internal fissures), in fact all of the marked examples are cloudy to some degree, as is this bowl. It is probable that after 1677 the chemical instability of Ravenscroft's formula, caused by insufficient alkali, was finally solved and that lead oxide was also added to produce what was, in effect, a new material: lead glass. Jugs and basins were the traditional equipment for washing in well-to-do households. But since glass was ill-suited to use with hot water, the usual materials for jug and basin sets from the end of the 17th century were delftware, Chinese porcelain and eventually Staffordshire white stoneware and Pearlware; finally blue-printed earthenware was used. More expensive English porcelain sets were available after about 1770. Various types of wooden washstand were developed for jugs and basins in the 18th and 19th centuries, later incorporating soap dishes and toothbrush trays.